Objective: We studied the efficacy of zoledronic acid (ZOL) infusion on radiographic and clinical outcomes after percutaneous kyphoplasty (PKP) for elderly patients with osteoporotic thoracolumbar fractures (osteoporotic vertebral compression fractures [OVCFs]). Materials and methods: We retrospectively analyzed 95 elderly patients (age >65 years) with OVCF. All patients were followed up for 2 years. Thirty-two patients were treated with only once-yearly 5 mg ZOL infusion (ZOL group), 34 patients with only PKP (PKP group) and 29 patients received ZOL infusion 3 days after PKP (PKP+ZOL group). Results: There were no significant differences in the patients’ age, gender, body mass index, lumbar spine bone mineral density T-scores, baseline of Visual Analog Scale scores and Oswestry Disability Index scores (P>0.05). 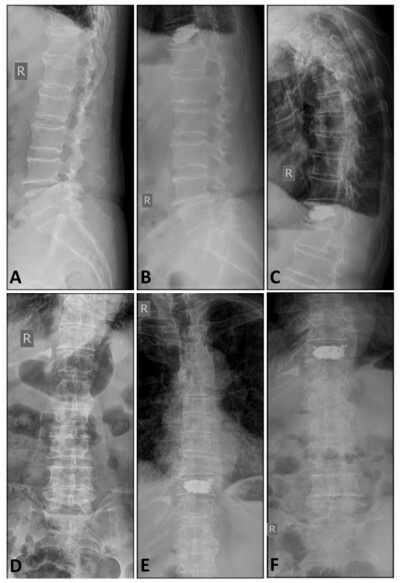 The postoperative vertebral heights of patients with OVCF after PKP and PKP+ZOL were 23.70±3.03 and 24.30±3.13 mm, respectively, which were significantly higher than that of patients in ZOL group (P<0.05). The reduction in degrees of kyphotic deformity in the PKP and PKP+ZOL groups were corrected to 8.4° and 8.7°. The bone mineral density T-scores of patients with OVCF in the ZOL group and PKP+ZOL group were significantly higher than that in the PKP group (P<0.05). The Visual Analog Scale and the Oswestry Disability Index scores of the PKP+ZOL and PKP groups were significantly lower than those of the ZOL group (P<0.05). The incidence of recompression vertebral fracture (RVF) in the PKP group was 14.7%, but there was no patient with RVF in the PKP+ZOL group (P<0.05). Conclusion: Once-yearly 5 mg ZOL infusion combined with PKP could provide beneficial effects in elderly osteoporotic patients with OVCF.